It’s fair to say that Walt Disney World Resort has been pretty busy lately, and will continue to be for quite some time. This year has already seen the unveiling of the color-soaked Toy Story Land at Disney’s Hollywood Studios. Fall 2019 will mark the arrival of the ground-breaking Star Wars: Galaxy’s Edge. With upcoming attractions like Mickey & Minnie’s Runaway Railway, it’s clear that the Disney has its work cut out. 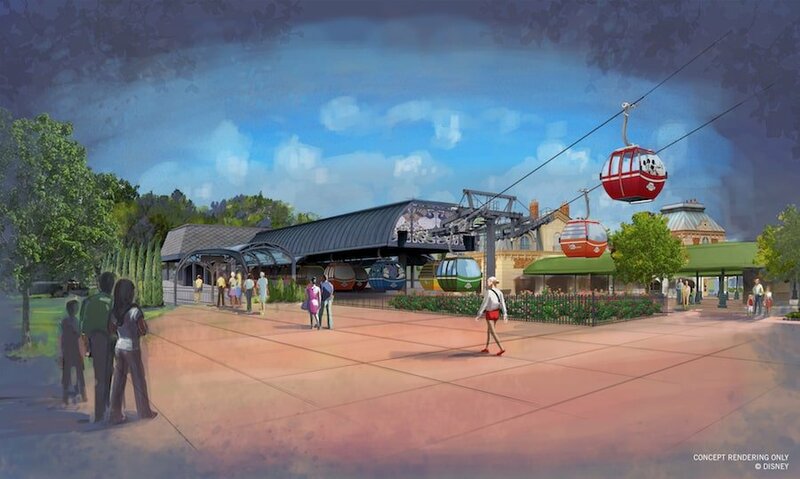 It may come as no surprise that there’s no set date for the new gondola system Disney Skyliner. Rumor has it that a late 2019 opening is on the table. With all these new lands and attractions, this new transportation system is needed now more than ever. You can probably anticipate an announcement in the coming months, in the meantime here’s everything you need to know about it. Sadly, Walt Disney World Resort is yet to introduce magic carpets and flying elephants (on that note, have you ever actually seen an elephant fly?). So for now you’ll have to make do with existing transportation systems such as the Walt Disney World Monorail and the Minnie Vans. That’s not to say they aren’t great and useful in their own ways, but if you want to fly above the resort – because who doesn’t – you will soon enough. As is the case with all things Walt Disney World Resort-related, Disney Skyliner will see you travel in true Disney style. Not only that, you’ll even be traveling with some of your favorite characters, too! Select cabins will boast classic characters – as well as the not-so-classic kind who are just as awesome - on their already-colorful exterior design, from the likes of Mickey and Minnie to Belle and Beast. These cabins are said to be the most luxurious in the world, and will offer spacious and comfortable interiors. This is no surprise considering that each one is said to hold around 10 guests, while the entire network itself will apparently support somewhere between 4,000 and 5,000 guests per hour per direction! Whether or not these cabins will include AC is unknown at this time, but you can at least expect passive ventilation, so don’t worry about being a little closer to the Florida sun!